While I may not be going to any music festivals this spring, it doesn’t mean I can’t dress the part! When the weather is nice in Dallas, my friends and I love plopping down on the patio at a fun bar or restaurant to enjoy the sunshine and lounge all day. On these days, I like to dress comfortably and cool (especially since Dallas is known for it’s scorcher afternoons). While I love a good pair of distressed denim shorts, I haven’t found a pair I like enough to buy this season. They tend to all be too short – anyone else having that problem? 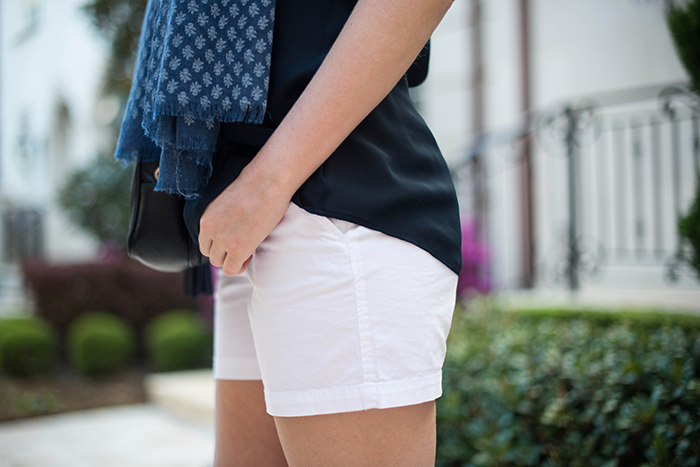 As an alternative to distressed denim shorts, I found a great tailored pair of white shorts that are both the perfect length and rise. Since my style isn’t very boho anyway, these shorts are just what I was looking for! Style them with a gauzy embroidered top and booties for a festival-inspired look, or your favorite tank and leather sandals for an everyday summer outfit. The shorts are only $20, so I stocked up and got three colors. I’ll be wearing them all summer long! These blue sandals are faux leather and are also only $20. You can’t beat a deal like that! Very cute casual outfit, love the sandals. Love this casual look on you – perfect for summer! Cute, casual look! I wish it would get warm and stay warm enough to wear these looks in NY! It’s always fun to have a “coachella” moment! Loving these sandals. The blue is a great option to have other than the typical neutrals. Such an effortless summer look, love it! Great casual outfit…You make ON look super chic! I have to admit I’ve scored a few fabulous finds at ON lately. Great scarf! Can’t believe most of the look is from Old Navy! Great casual look! Love the scarf! Such a cute casual spring look, Merritt!! Love it. How obsessed are you with the Gucci bag? I have the exact same one and wear it all the time… Featured it on my blog, Palm and Peachtree, last week! 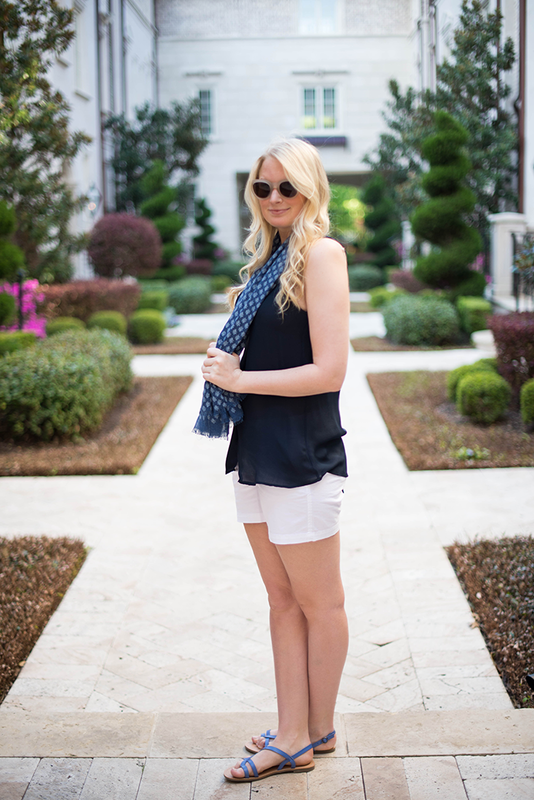 Navy and white is one of my favorite combos! So crisp and clean for warmer months. I love the scarf! It breaks up the ensemble and gives it a finished look. I need to head over to Old Navy asap! I love this blue/navy look! And those sandals are so cute! Love this outfit.. wish it was shorts weather where I am !! Those shorts are only $20? I think you exercised some serious self-restraint only buying 3 pair! They look great on you! Off to do a little short shopping myself…. Love that top and scarf! You are a pro Merritt !! Wow!! I can’t believe that whole outfit is from Old Navy!! You make it look so expensive!! Great job! The scarf is so great! Such a great relaxed, comfortable look. 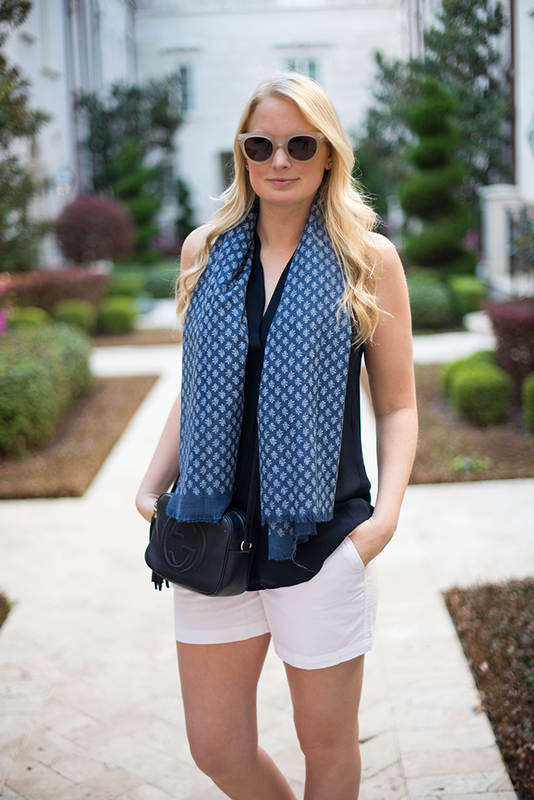 Blue really looks great on you, and the print on the scarf is great over the black blouse. It almost looks like part of the shirt. I’ve been looking for some cute flat sandals- yours are so great and the price is pretty sweet too! The scarf and the bag top this look perfectly! Can’t believe most of these pieces are from Old Navy…Nice! This is the perfect Florida outfit! Love everything here! Old Navy rocks! I really love those sandals! Definitely going to have to check them out. I love this relaxed look on you! I rarely shop at Old Navy, but they’ve been doing awfully well lately! I’ve been looking for a pair of white shorts that aren’t sheer. I might have to check these out in person.